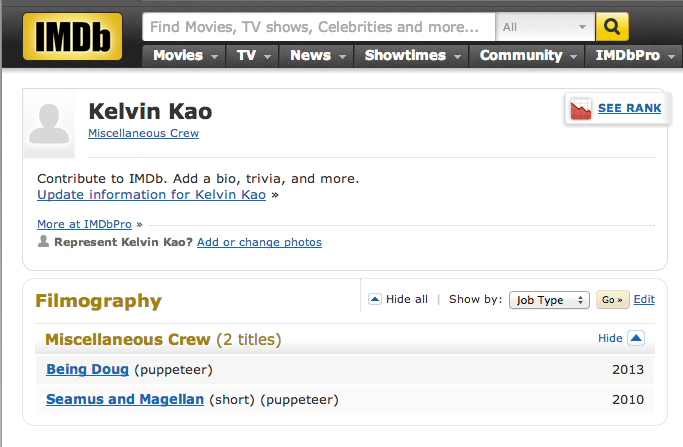 It’s a good day to see another IMDB credit under my name! This time it’s for Being Doug, a Chapman film school thesis project that I helped out with last year. Looking forward to seeing the finished product sometime this year! I guess we’ll have to wait until April 5th to see it. Hm, I didn’t even notice the April 5th part. I guess that’s what they are aiming for. As far as I know, they are still trying to finalize on a premiere day at the film school. Hi Kelvin, when it comes out, I hope you’ll send out the link. I’ve definitely been impressed with your puppeteering work. Good to see you around again, Chris! It’s about a ventriloquist waking up one day and realizing that his dummy is alive and they have switched bodies. So yes, there are puppets.